Even before the official announcement of dates of elections in states like Rajasthan, Madhya Pradesh and Chhattisgarh, or elections to the Lok Sabha, campaigns, rallies and advertising have already started. Politicians are already beginning to woo voters. Parties have begun to promote fake news and disseminate false information with contrived statistical data to convince people. Huge money is being spent on advertisements. 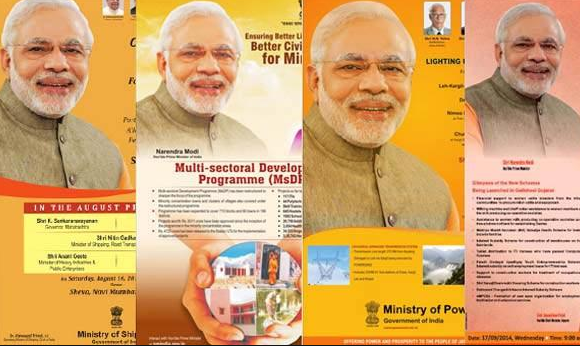 The BJP seems to be in the forefront on spending money for advertisement and publicity. Aam Admi Party member Ashutosh questioned BJP in 2014 itself on spending Rs 400 crore on advertisements. The party spent Rs. 2,000 crore over the last years three year anniversary advertisements, according to Sisodia. Sisodia also said that the Comptroller and Auditor General (CAG) can compare the AAP government’s advertisements to the BJP government’s to see if taxpayers’ money has been misused or not. AAP was reacting to a CAG report, which accused the Delhi’s AAP government of spending a total of Rs 33.40 crore on releasing advertisements outside Delhi, violating advertisement guidelines issued by the Supreme Court. In 2015, the apex court issued guidelines to prevent ruling politicians from misusing taxpayers' money on advertisements. According to a Right to Information (RTI) reply to activist Anil Galgali, the Central government has splurged Rs 4,343.26 on advertisement and publicity in media. Bureau of Outreach and Communication (BOC) financial advisor Tapan Sutradhar in his replies gave figures of government spending on publicity, print publicity, electronic media publicity, outdoor publicity, etc. Galgali said that after the criticism of opposition on government's squandering of scarce public resources, the government had to finally cut down spending. However, the spending is still higher this financial year when compared to its first year in office. The spending on publicity is high. With the money spent on advertisements and publicity, the NDA government could have provided mid-day meals for 45.7 million children for a year. One day wages for 200 million workers under the Mahatma Gandhi National Rural Employment Scheme could have been disbursed. About six million latrines could have been constructed, or at least 10 Mars missions could have been undertaken. The government spent Rs 4,480 crore ($753.99 million) on advertising its flagship schemes in the 52 months between April 2014 and July 2018, according to the information made available https://www.firstpost.com/india/rs-4800-cr-spent-by-bjp-government-on-ads-could-have-fed-46-million-children-midday-meals-for-a-year-built-6-million-toilets-4936701.html to the Rajya Sabha by Rajavardhan Rathore, minister of state for information and broadcasting. This amount is double the amount spent by its predecessor in 37 months. According to “India Spend”, many welfare measures like financing secondary school education, building roads, electricity generation could have been with this money. There has been a rise of 34% in spending on publicity and advertisement from Rs 980 crore in 2014-15 to 1,134 crore in 2017-18. The trend may continue this year. Spending enormous amounts on mere advertisements should be questioned. Publicising welfare schemes is necessary because people should know its provisions, but spending on just propaganda and achievements of the party is wasteful expenditure. Since peoples' funds are involved, they must question whether spending large amounts is essential for the government. Taxpayers' money must be used judiciously, keeping in view the welfare of the people, and not promoting the chances of victory of the ruling party in the next elections. Civil rights groups and educated intellectuals should explain the importance of judicious spending of public money by the government.